INDIANAPOLIS – Dec. 10, 2015 – DIRTcar Racing announced today at the Performance Racing Industry show the 2016 UMP Summer Nationals schedule and DIRTcar Summit Racing Equipment Modified Nationals schedule. Annually one of the most challenging schedules in all of motorsports, the Summer Nationals tour kicks off at Brownstown (Indiana) Speedway on June 15. For five weeks, the tour takes some of the best late model drivers in the country and pits them against each other at 28 races in Iowa, Indiana, Illinois, Wisconsin, Tennessee, Missouri, Michigan and Ohio. Friday and Saturday events throughout the tour pay $10,000-to-win, except the opening night at Cedar Lake Speedway which pays $5,000-to-win. The 2016 Summer Nationals champion will be decided at Oakshade Speedway in Wauseon, Ohio on July 15 and 16. Competitors who managed to make it through the tour will battle it out for bragging rights and a $25,000 prize. This season, the Summit Racing Equipment Modified Nationals Tour covers 28 races in five states across eight weeks. The tour kicks off at the Terre Haute (Indiana) Action Track on June 12 and then heads to tracks in Illinois and Tennessee through the opening weeks. 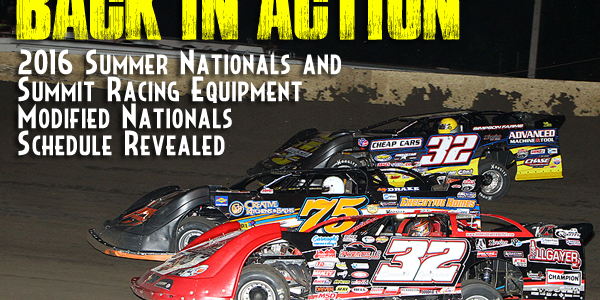 The tour meets up with the Summer Nationals late models on June 15 at Brownstown Speedway. The 2016 Summit Modified Nationals again joins the World of Outlaws Late Model Series for the Prairie Dirt Classic at Fairbury (Illinois) American Legion Speedway on July 29 and 30 to wrap up the 2016 tour. Follow the Summer Nationals and Summit Modified Nationals on Twitter at http://www.Twitter.com/SummerNationals or on Facebook at http://www.facebook.com/SummerNationals. Stay up-to-date with the latest news from the series throughout the lead up and the summer on the series’ websites at www.TheHellTour.com and www.ModifiedNationals.com.